Walter deForest gave a superb performance as Van Gogh and brought the Dutch master's life and his work to life through telling his story. 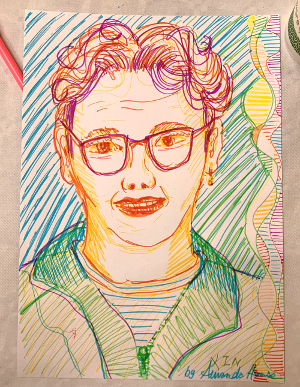 Participants were encouraged to draw their audience neighbours and this is a portrait in pen of a gentleman we just met called Xin. As these were the first portraits we have done for some time we were pleased when Xin wanted to take it home to enjoy with his family who were also enjoying the cultural occassion. 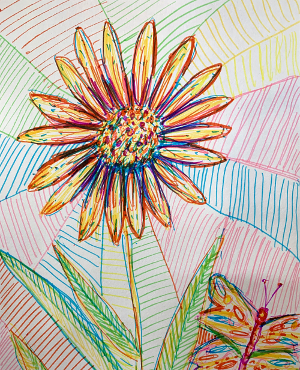 Everyone drew sunflowers throughout the evening of course! 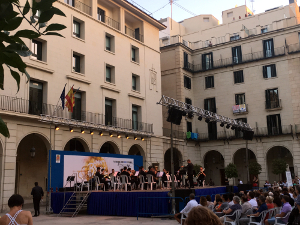 It was great to experience such a high qulity inclusive accessible arts production in an inner city area which is currently going through a lot of change and regeneration. This community arts center is the home of Draper Together which is a charity that aims to forge a strong and positive community through its inclusive programme which focuses on youth arts and theatre. 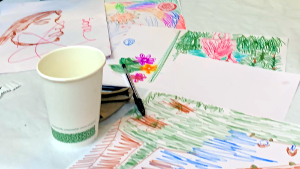 Drawings by the Li girls at Drapers Hall[/caption] People of all ages had an educational and fun time and everyone enjoyed the delicious home cooked supper and hot drinks that were provided so carefully by the enthusiastic team at Drapers Hall. We look forward to going to more special shows at this Southwark centre soon and more brilliant crazy art days in the future! We also plan to see the Van Gogh exhibition at tate Britain which is in London for a couple of months from the end of March and is sure to be a visual treat! This special seat was part of a set that had been handed down through the generations. It has been enjoyed by all who sat in it during numerous splendid gatherings in a spacious dining room in the country county of Kent. This carved wooden armchair is wonderful memento of many jolly times around the table and still a very useful furniture piece. Our 'garden room' in the cottage in West Sussex is normally used as a work room and provides an office and studio space with excellent natural light for writing, reading, computing, drawing, painting and sewing. 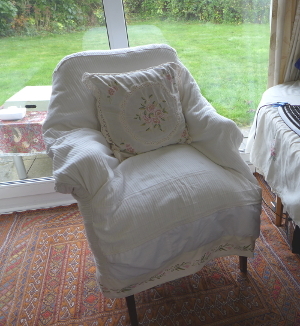 This charming room needs one good comfortable cosy and attractive chair that can be used for all of these various activities. The garden room also doubles as a guest bedroom for when friends from afar come to stay with us. A variety of fabrics are folded and draped on the cream metal bed as textile projects progress. A soft and warm solution was required for this furniture newcomer to enable the seating to feel homely as well as being strong and practical. 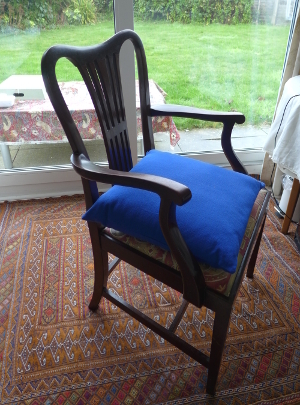 First we added a large plain blue coloured cushion from John Lewis. 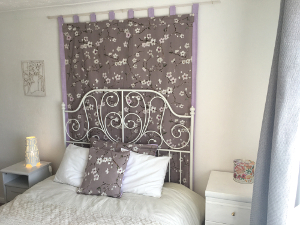 We found an unwanted second hand cotton and polyester mix striped set of cream curtains in perfect condition. We cut off the curtain tapes so we were left with just the flat fabric to work with. We measured all the sides of the chair individually starting with the front face and made a simple diagram on a piece of paper to record these basic dimensions. Next we took an extra duvet cover in new condition and cut out the basic flat shapes that make up the front, back and inner sides of this vintage furniture piece. 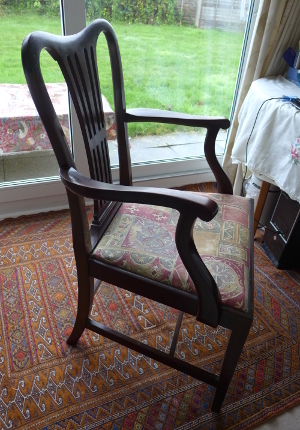 We ensured that the pieces would combine when sewn together to cover the whole item with around 10 centimetres of the feet of the chair left visible at the base. This allows the floor to be seen underneath the loose cover which helps to visually open up the room and help keep it from feeling cluttered. 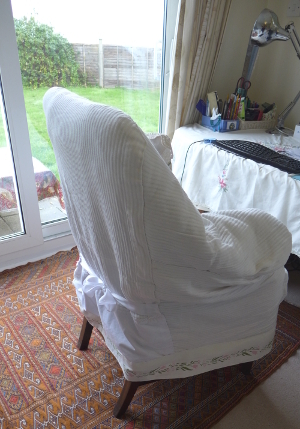 When all the parts were cut out of duvet wadding we attached them to the matching stripey fabric shapes for each part of the chair. 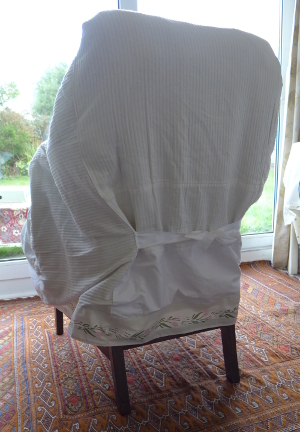 We made sure that the wadding was tacked in place to the 'wrong side' of the fabric so it wouldn't be seen once in use. We used one piece of fabric to create a central 'draped seat' section that covers the blue cushion and minimise the amount of detailed sewing required. 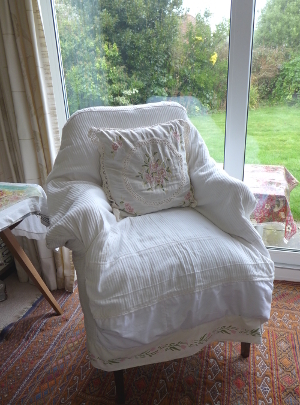 By 'offering up' the fabric and using the chair as a template, a loose cover can be created quickly without the need for more than basic dimensions. Hand sewing pieces together making sure the raw edges are left on the inside when the cover is finished can sometimes be quicker when making small projects. A degree of 'crafting' as you go along is involved. The sewing machine can be used if it is easier or alternatively just for binding the longer seam joins if this is more comfortable. This technique is reminiscent of wrapping a large present which is a slightly less than conventional shape! Then once we were happy with the cover shape we stitched on two half a meter lengths of 10 centimetre wide cream ribbon. This was attached to the lower back face of the chair which then allows for easy removal whilst also gathering the loose cover into a more fitted shape. A cute bow is tied to enhance the simple design. We then took off the cover put to one side while we cut generous cream cotton lining fabric pieces to fit inside our stripey fabric and padded faces structure. 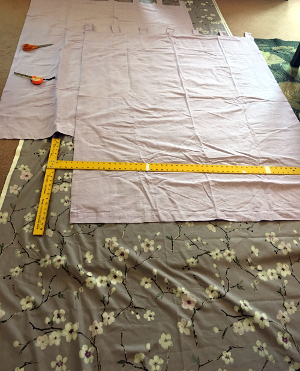 Using the sewing machine combined with hand sewing we turned our cover inside out and attached all the lining faces. We took care to make sure the raw edges were on the outside this time so when the cover was turned the right way round again, all the sewn edges are all tucked neatly out of sight. 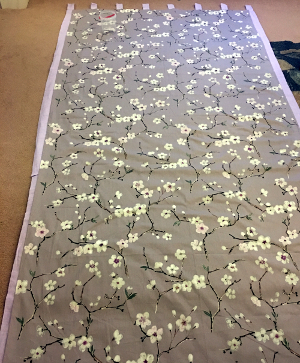 Finally using small stitches and cream thread we added a vintage Laura Ashley tulip design stencil border in soft pink and green on cream cotton all the way around the bottom edge of our freshly made loose covering. 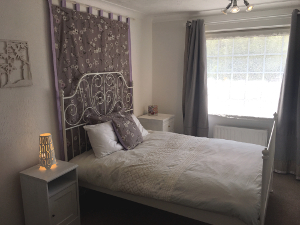 An embroidered cream cotton scatter cushion with light pink flowers and crochet lace edging adds extra back support and coordinates perfectly with the other ivory soft furnishings in this peaceful and sunny room. 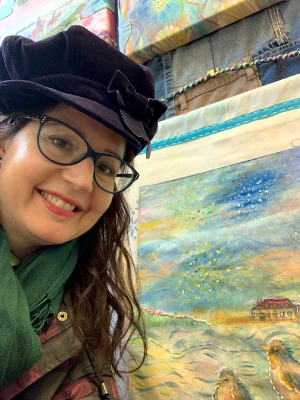 To see more hand crafted and original textiles by Create Display visit us at Bosham Walk or check out our online etsy shop….look out for more new pieces in the pipeline this Spring! Happy Valentines Day from Create Display! We hope you are enjoying a Thursday full of love and laughter and have lots of special events with your nearest and dearest planned for this weekend too. 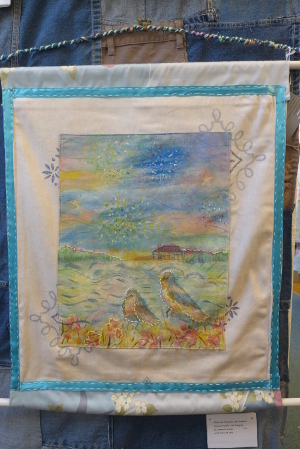 This year we are celebrating the romantic festival with a new wall hanging featuring two love birds and some fireworks in the sky above the harbour. We also have a range of hand crafted fabric textile pieces that make great presents for giving to someone you know really well as a surprise that will delight them and add character and colour to their home. 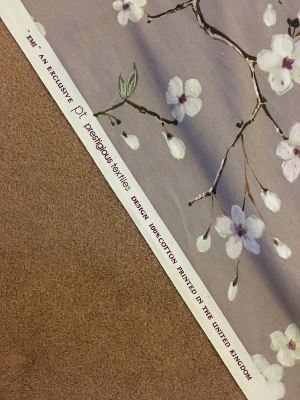 All our textiles come with a designer label and are ready to hang and all made in the studio in Bosham in West Sussex. 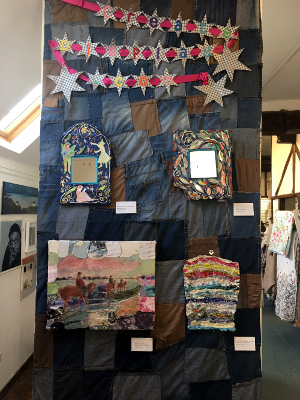 We also added a string of hand made vintage wall paper hearts to our upcycled denim display at Bosham Walk Art and Craft Centre in West Sussex. Whilst we were there we enjoyed a wonderful treat at Wendy's cafe with amazing chocolate cake (gluten free also available) and a delicious coffee. 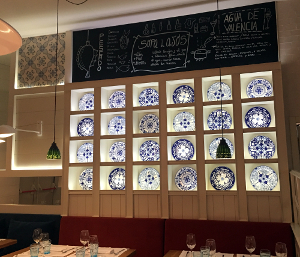 The new restaurant redecoration is fantastic with a wood burning stove, beautiful dove grey walls hung with splendid nautical framed artwork and cosy cushions in lovely fabrics chosen by Shah who is one of the talented makers in the team. 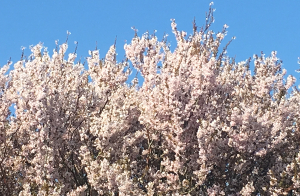 The finishing touch is the roses and tulips on the tables and this makes Bosham Walk the perfect place to escape with your loved one for a stroll together by the water and a cosy catchup with tea and locally baked treats. If you can't make it down to the south coast anytime soon do have a look at our etsy.com shop and feel free to get in touch….more new stock coming soon! We hope you have a had a super Christmas or whatever holiday festival that you celebrate. 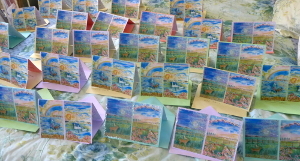 December was a busy and creative month for us as I am sure it was for most people. We enjoyed the arrival of the red nose reindeer's and some sparkling winter cheer with the makers at the Bosham Art and Craft Centre in West Sussex. 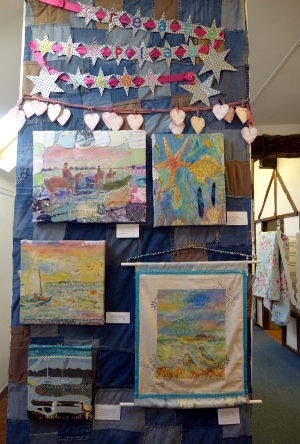 We added some new textile art pieces to our patchwork denim display in the gallery upstairs. Every year we decorate our homes and studio space enthusiastically. This year we continued the tradition with handmade Christmas cards to give to friends and family we meet over the winter celebrations. Sparkling lights and reflections on water and living in Chichester harbour were the theme of this years designs which included views of the local village. 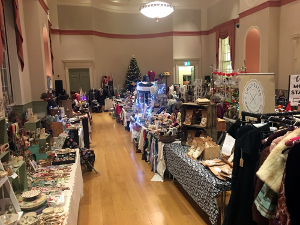 We were very pleased to be part of the 'Vintage and Very Nice' Christmas Vintage and Handmade Market that was held in the historic and monumental Assembly Rooms in North Street, Chichester, West Sussex. 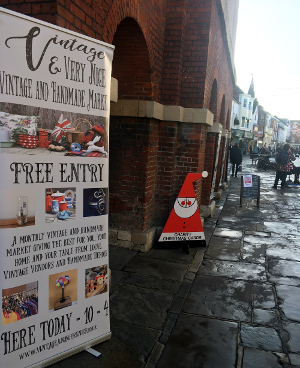 It was an opportunity to team up with other small businesses and get into the festive spirit with around thirty different local makers and vintage experts. 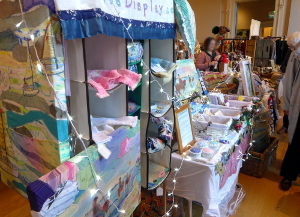 Our 'pop up shop' featured a selection of our small and medium sized textile artworks and handmade gifts. Held over three days from November 29th to December 1st this event incorporated the first Christmas late night opening of the season and this was an opportunity for some bubbles and mince pies all round! Special thanks to Daryl the Event Manager for some splendid leadership and impresive creativity to happily accommodate some extra sellers requesting stands at short notice. A massive thank you also goes to talented makers Jan and Vanessa for taking care that our exhibition stand was all sparkling and ready to go and making the time just fly along with their good fun and company. 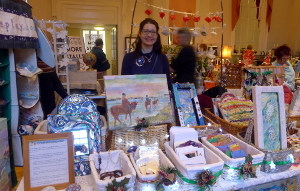 We all really enjoyed meeting lots of new people and supporting other local artists. 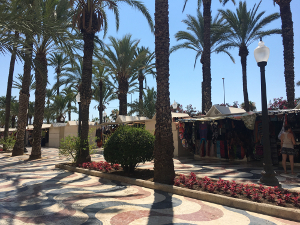 Plus we got to shop locally with all the tempting fashion, food and goodies at the fair. We look forward to more special events this year and supporting more Vintage and Very Nice Fairs in 2019. We wish everyone a wonderful year full of creativity, friendship and peace. More details to follow soon about some of our new designs previewed here on our Christmas cards. 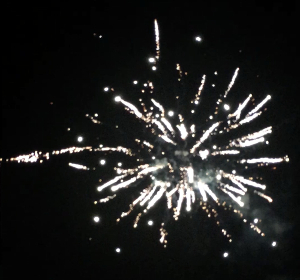 This year the sky has been full of colour, bangs and wizzes as the fireworks burst into their neon glory all over our local village. 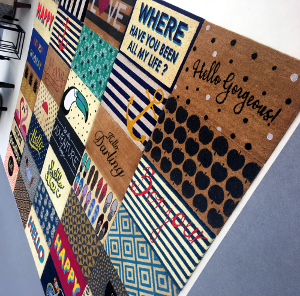 It is the perfect time to pop up our latest handcrafted design, an upcycled denim backdrop to add some nautical texture and really set off our colourful interior artworks. We used a dozen pairs of old jeans to handmake this eco friendly display background. We are very pleased with how it adds individuality and interest to our area at Bosham Walk Art and Craft Centre. 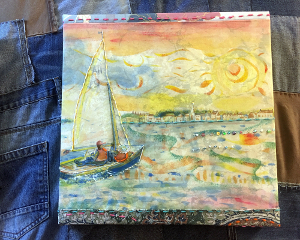 The idea was inspired by the Japenese art of Boro where fabric was precious so Japenese people hand sewed hundereds of small pieces of denim together to make new materials they could make into clothing and home furnishings. Our Create Display Banner with silver stars is the perfect signage banner to top off our new display background. 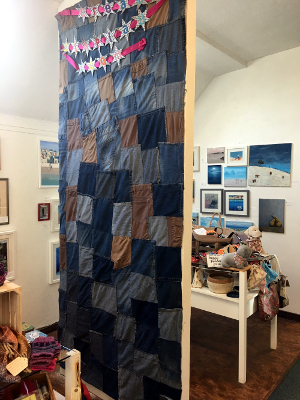 We backed the blue and chestnut patchwork cloth with calico and added customised curtain tape to the hanging edge. Using a drill we attached a baton with brass hooks as high up as possible to give us maximum visual impact. We look forward to adding new pieces of denim as we go along and as we put up fresh pieces over the coming season. 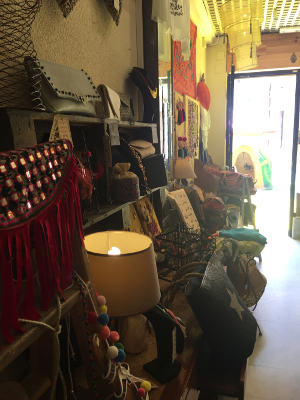 Do visit us at Bosham Walk to see all the art and crafts arranged on two spacious floors. Enjoy a stroll along the harbour and a delicious tea at Wendy's cosy cafe. This thrifty recycled fabric wall hanging will be a creative customised collage that develops as we go forward. 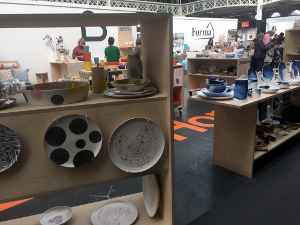 Buyers for all sorts of retail and leisure shops and boutiques in the UK and abroad make a bee line for the wonderfully diverse selection of enterprises available at Top Drawer. Around 1000 design-led brands promote their wares and creatively make the best use of every meter of space they are allocated for their temporary pop-up shops. Interior Designers and industry professionals also attend and they are often looking to furnish a variety of contemporary spaces with the latest quality merchandise. There is a relaxed but slightly exciting feel in the vast iron and glass hall which was originally built in 1886. 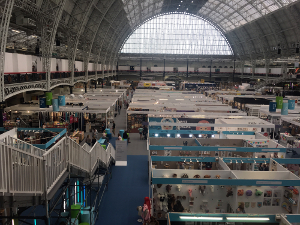 The first day at Top Drawer has the advantage of finding all the new products first and being 'ahead of the game' for a busy week ahead. 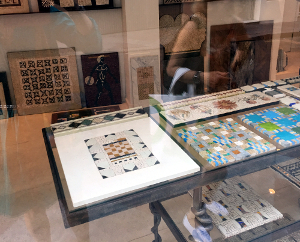 Many traders sell stock directly from their stands allowing early bird visitors to choose the finest pieces first. There is also an opportunity to order limited edition items before they run out. 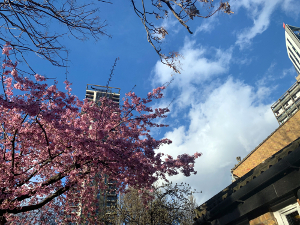 Travelling on a Sunday to Olympia is a breeze for many folk living within striking distance of the capital who want to avoid any rush hour hassle. 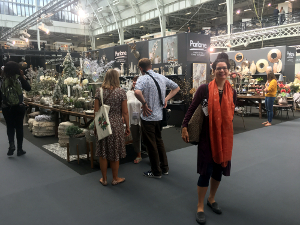 In the manor of a department store the Top Drawer show was split up into sections that encompassed the relevant product ranges for 'home', 'gift', 'greetings and stationary' ,'wellbeing', 'play', 'fashion', 'craft' and a 'food emporium'. A key part of the show was the mini masterclasses, demonstrations and presentations on stage which added to the 'fashion week' atmosphere. Eminent speakers with specialist knowledge shared the latest thinking and tips for creative businesses. Spread over the three days this 'retailfest' attracted audiences keen to learn about everything from colour and design theory, to tips on international trading in a digital age. 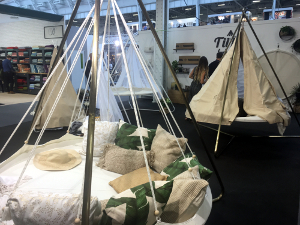 The Home area was full of stylish natural looking products that would fit happily in both modern and traditional homes and work spaces. Generally most wood, bamboo, ceramics, glass, leather and metal pieces all had a simple handmade feel. 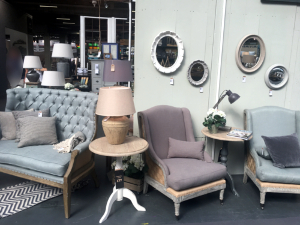 Rustic and friendly looking pieces that could be incorporated into many spaces with ease were in abundance. Several manufacturers offered ranges in soft light colours reminiscent of the 1950's. Furniture designs were comfortable and reassuring. Luxury looking feature pieces in opulent materials like marble or velvet had metallic accents and a timeless investment look about them. Bombay Duck made a statement entrance with a tiled carpet made of bold and witty doormats. Annie Sloan presented a range of pure and plain fabrics in calming colours to accompany the famously chalky paint range. Parlane showcased faux flowers and plants blended with pared down and elegant interior elements. Forma stacked super pastel bowls and colanders that are made of environmentally friendly bamboo and corn. The British Colour Standard was the forerunner to the Pantone colours widely used today. 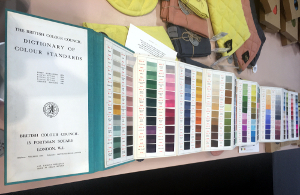 The hand dyed silk colour dictionary transported us back to the 1930's with splendid names such as pertunia purple, grenadine red and Brunswick Green. 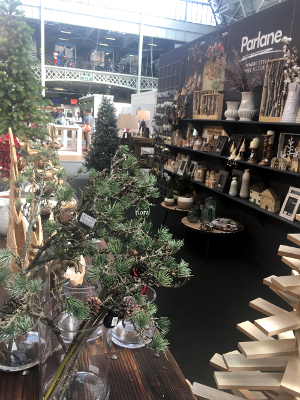 If this show is anything to go by then Christmas 2018 stores, homes and leisure spaces will be a wholesome mix of traditional green trees and old fashioned toys. There will probably be a flurry of sparkling glass droplets reflecting against gleaming mirrors in December. Organic decorations made from real and dried greenery, interwoven with fruits and berries will almost certainly be thrown into the festive mix. Extra candles and oil burners will provide a warming scent of spiced spruce. Richly decorative wallpaper may elevate the most sophisticated dining rooms, sitting rooms and bedrooms. Muted deep jewel coloured walls are fashionable and useful for encouraging a more adult 'boutique hotel' feel for those in the mood to entertain and enjoy long evenings full of soothing music and cosy conversation. Merchandise available in the gifts section emulated the themes from the Home area and also additionally aspired to lift the spirit. Small but beautiful and cleverly designed items that would be both a joy to give and receive could be found at many gift companies exhibiting. Prints were unique and bright with crisp graphic patterns that are either botanical or from some exotic jungle. Most of the striking gift items would happily enliven any home that would otherwise be rather too neutral. 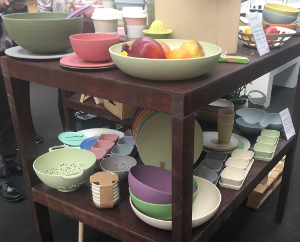 Newcomer to the show Lily Juliet from New York spread out a glowing rainbow of opalescent acrylic bowls and kitchen accessories. These Lily Juliet marbled pieces often feature shells from the far east encased within. Corkcicle arranged in neat rows numerous gorgeously shaped and durable steel water bottles. The special portable drinks containers were decorated in liquorice allsorts tints. The exhibition continued with small businesses stands groups on large 'wellbeing' mat. The jewellery and fashion accessories displays were situated on the first floor and gave the visitor an opportunity to meet the latest designers all in one place. Bags were simple and functional with leather being popular. Scarves were voluminous, woven and heavy looking for the season and available in every paint box pigment. Jewellery was very wearable and made out of rose gold, gold or silver. Delicate shapes and chains with simple designs and stones. A dash of glamour and glitter was added by Annie Sherburne with her handmade diamante earrings, necklaces and brooches guaranteed to add some party spirit to the holiday celebrations. We ventured off piste to the realms of the food emporium where we were tempted by the wonderful array of hand crafted delicacies. The thought, time and passion that had gone in to all the heavenly produce was impressive. Delicious confectionery at Lavolio included little sugar eggs with marzipan and nuts and a whole host of fun and nutritive flavours. Aelder Elixir was selling an distinctive elderberry liqueur made in Scotland that is perfect to heat things up as the temperature falls. The Hawkshead Relish company produce over 100 relishes, pickles and preserves. We particularly liked Hawkshead Relish's chunky Christmas table version. New start up business Cult vinegar lead the way with an impressive combination of very tasty tonics that also improve gut health. The large cone shaped canvas hanging basket to relax and enjoy time alone of with close friends and family comes in its own carry case like a tent. We have added one to our garden wish list but you can use them to make a snug hideaway indoors too. 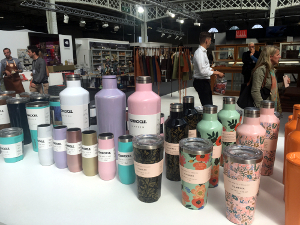 The sheer quality of the home, fashion and food ranges on display at the show was extremely encouraging and an indication of the ambition and the determination to succeed in small British business right now. For many belonging to 'generation X' one of the most memorable childhood events can be the introduction of the package holiday that became popular in the 1970's. This made it possible for normal people to take a whole family abroad for a week or two, to a magical a land of warmth and relaxation. Air travel became possible for many people for the first time which added to the convenience and enjoyment of their annual European adventure. 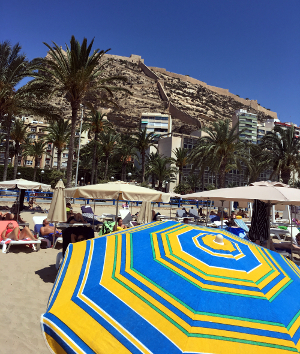 The Costa Blanca has been a favourite happy place in many lives ever since and there are few things more fun than a vacation exploring the many delights this area has to offer. A vivid array of sunlit umbrellas randomly lighting up the long sandy beaches is a resplendent sight when set against the water and the sky, which gleam in the heat in high season. These vintage silk scarves lift the spirits and are perfect for travelling and channel the celebratory nature of this time of year and the arrival of weather for cruising along somewhere in France, Spain or Italy. 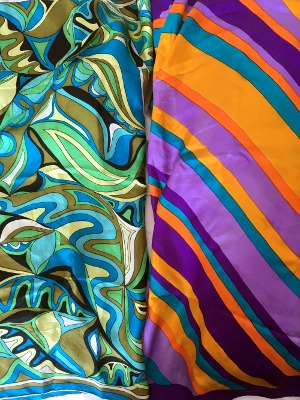 The sea tones and swirls looks like it could be by Emilio Pucci but we are not exactly sure and the purple one is a design by Yves St Laurent. Any good accessory departments in major stores will have a selection ready for this season. They are such adaptable pieces they would also make a statement as cushion covers or if you don't like to wear them they could even be framed as eye-catching artwork. 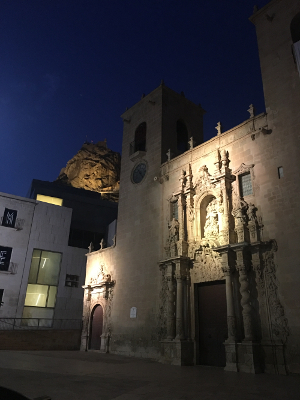 In Alicante we were awestruck with the gorgeous jewellery that caught our eyes as we strolled past the fabulous windows at Coolook. There were so many pieces that are the sort of luminous real gems that could be worn anywhere to bring along the glamorous vibe and natural charm of this stunning coastline. Like delicious fruit flavoured sweets Coolook jewellery will add juice and sparkle to any August outfit. 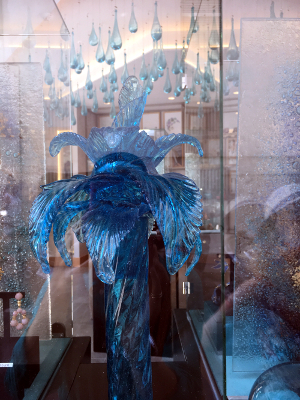 The blue glass palm trees and turquoise glass droplets cascading from the ceiling make an unusual and appealing display for this pretty boutique's treasure trove. 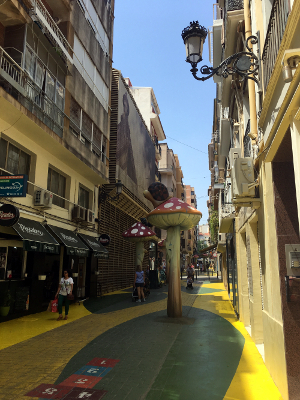 All the colours of the rainbow were represented all around this large shopping district that is anchored by the spacious El Corte Ingles department store. Like some spectacular retail fiesta, a kaleidoscope of plain bright pieces are the order of the day when the temperatures hit thirty degrees and above. This year everyone is invited to try out the all-in-one jumpsuits, floaty dresses and voluminous shirts often embellished with embroidery anglaise or bold crochet detailing to continue the midsummer folk festival theme. 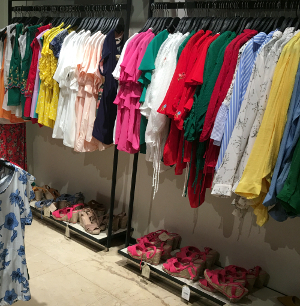 Spanish brands like Mango, Zara, Massimo Dutti, Bimba Y Lola, Stradivarius, Desigual and Bershka all have creative, fashion forward designs with super and often sophisticated collections. 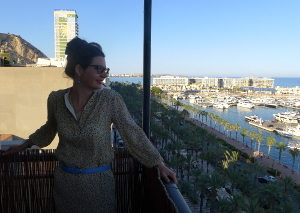 These splendid Spanish boutiques can confidently compete with any of the successful London and Paris clothing companies. 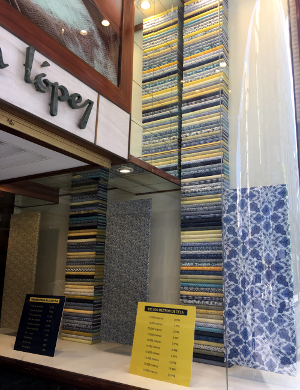 We were also really excited to discover the strikingly neat cobalt and yellow fabric stacks in the double height entrance to Julian Lopez. Blown away by the scale of this store we were thrilled to find such variety in stock. Alicante's destination store for everything to do with sewing and dressmaking, it was wonderful to find such a well stocked emporium extending around three floors. 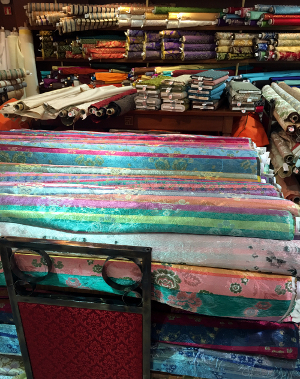 The prices were very tempting, so we will definitely be heading back to top up our textile stashes, from Lopez's awesome array of different hues and materials. 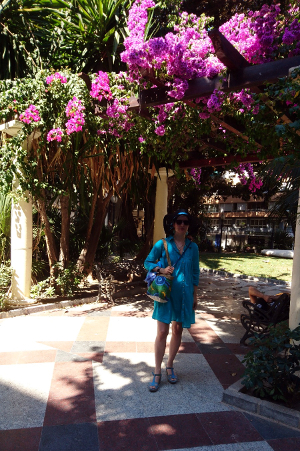 Making your own uniquely simple Kaftan cover up or floaty sarong is easy and there are lots of free tutorials online. It is a pleasure to choose from such an amazing selection of beautiful bolts and radiant rolls. As the thermometer heads up to the high thirties its time to enjoy wearing your best saturated threads. It is a great moment to be outside and paint and decorate your home and garden with pops of intense tints. 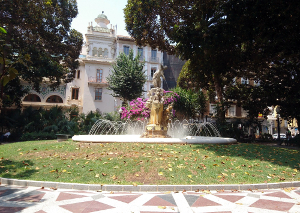 It will lift your mood and help you be at your best and brightest like the finest midsummer flowers along the Mediterranean. On Saturday 16th June 2018 from 11am and on into the evening comic and gaming enthusiasts dressed up and celebrated their heroes. A big crowd turned out to enjoy a day escaping from reality, by the seaside. The atmosphere was exciting and friendly and set against the stunning backdrop of Portsmouth's most exclusive and picturesque marina. Port Solent Marina is tucked away at the top of Portsmouth harbour in Hampshire in England and provides an excellent haven for yachts, sailors and superheroes. There were queues of cars waiting to enter the car parks and playing fields that were assigned as an extra overspill car park for the day. On stage were a variety of celebrity guest singers and characters such as Star Wars e woks and Harry Potter Goblins and other creatures that were definitely out of this world. Members of the public in fancy dress were invited onto the stage to present and talk about their favourite stars from books, magazines, film, TV and video and online games. Professional character costumers and cosplayers chatted and mingled in with the crowd including several Transformers, Captain Jax Parrow, Ghostbusters and many more. Stall holders selling merchandise relating to every Comic, superhero and fictional film stars imaginable lined the promenade. 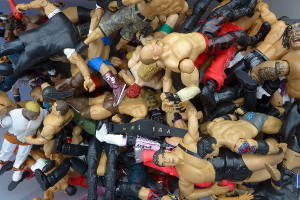 Toys and collectables were on display for shoppers to browse through and take home their special mementoes. Many accessories were selected by fans to wear to the next Comicon. The galactic looking cake and sweet stands provided a multicoloured rainbow of power snacks for the strolling visitors. 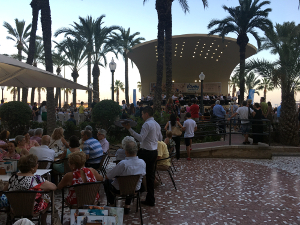 Between the stage shows and before the Blue Brothers music continued the party into the night, many visitors took advantage of the children's play area and the wonderful selection of restaurants and shops that the marina has to offer. There were indoor games tournaments and even an underground zombie experience according to the brochure. The day was fine and dry everybody seemed to enjoy the scenery and the buzz of the mini outdoor festival. The combination of the bright theatre unfolding in the centre of The Boardwalk and the beautiful white boats coming and going through the water was an excellent scene enjoyed by the hundreds of people who attended. Port Solent undoubtedly profited from the stalls pitched by the traders and GoGeek events were hired to help deliver this specialist event. Port Solent marina promotes the marina's retail and leisure facilities that include a multiplex cinema by holding a calendar of events throughout the year. 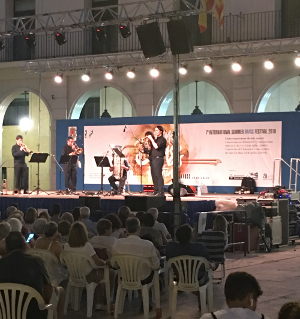 These include music concerts, vintage car rallies and craft markets to compliment the existing businesses. The activities and draw of the inviting marina environment helps to attract new regular visitors. The day was organised by Port Solent management in conjunction with GoGeek events. Many different ages of people got involved and dressed up. 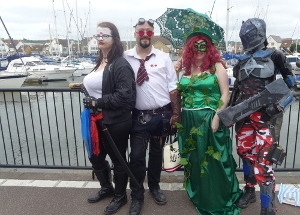 We especially enjoyed meeting Tango Mike's pirate character in a trio of supernatural Cosplay vamps in homemade outfits and Daryl Jones a Hampshire based Transformer cosplayer dazzled onlookers along the decking in a striking silver and gold costume. We were impressed with a girl who introduced herself as Superman's enemy Gomorrah and her marvellous sidekick, both glowing in dramatic green and brown face and body paints. We often hear that we will all become technology nerds locked up in our bedroom gaming. It was very refreshing to see local people getting creative and enjoying positive and fun times together and happily recreating a well loved Spiderman or a Lara Croft lookalike. 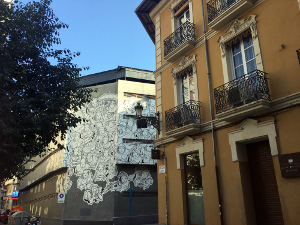 …and we think the future might be fantastic.